To obtain a six figure GR as typically used with maps, simply use the three digits in the middle, ignore the last two digits. Then press the PAGE button to return to the POINTER page. Press the UP DOWN button until Bearing appears. This is the bearing to your desired waypoint. A small "m" after the bearing indicates it is a magnetic bearing. If you are in a screen you don't want to be in, simply press the PAGE key until you return to the top-level menu. The PAGE key acts like the Esc key on a standard PC keyboard. 1 Turn unit on – press and hold the PWR button for two seconds. You will see the Welcome page followed by the Satellite Page. 2 Obtain a satellite fix – Ensure the sky overhead is relatively clear of obstacles. 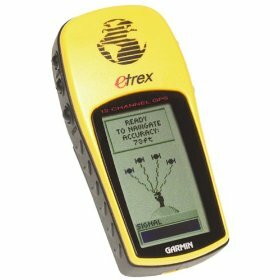 wait till the eTrex communicates with 4 satellites. An accuracy value will appear. 3 Check battery – Press the PAGE button until the MENU screen appears. At the bottom of the MENU page is a battery icon. If batteries are low then consider replacing. Ensure you carry a spare set of fresh batteries (2xAA). 5 Confirm your current location – press and hold the ENTER key for 2 seconds to obtain your current Grid Reference. You are now ready to proceed – generally leave the unit showing the POINTER page (the one showing a sample compass) or the MAP page. You may leave the GPS unit on while you are on the move. Leaving the unit on improves accuracy in obtaining a Grid Reference and provides a log of your travels. To conserve batteries, turn off the unit while at base or during long stops. Carry the GPS high – your body will block the satellite signal if carried below the waist. Attach the carry case to your pack's shoulder strap or place the GPS in the top pocket of your pack. 8 Check interface mode - Go to MENU - SETUP - INTERFACE. The I/O format should be GARMIN. On the 1st day of a trek – Go to MENU - TRACKS - CLEAR.